And, no, I'm not out of my Vulcan mind. There's a Canadian company -- that's in Canadia, I think -- called Federation of Beer that sells something called Vulcan Ale. It comes in bottles (in Alberta, British Columbia, and Saskatchewan) and cans (Alberta and Ontario). And, it's officially licensed by CBS Studios, who owns the rights to Star Trek. It's brewed by a Montana company, Harvest Moon, although Vulcan Ale isn't for sale in the U.S.
Now, if you look at their Website, they have a little blurb up about Klingon beer coming soon. It will also be sold by Federation of Beer, but it will be brewed in the U.S. (by Tin Man Brewing in Indiana) according to the Hollywood Reporter. The beer's flavor draws from blending rye malt with a traditional clove character, creating what CBS calls "a bold beer suited for the harsh Klingon lifestyle." The beer will be previewed at the Nightclub & Bar Show in Las Vegas on March 25, before being released across the U.S. and Canada later this year. Though I'm a Star Trek fan -- Kirk>Picard -- I'm not a beer drinker. So, this won't impact me much. Even if I was a beer drinker, I don't know how much it would impact me. I mean, if they made Star Trek cereal, I might, as a kid, want a box of that. It'd taste like veQ, but begin a kid, I'd eat it up anyway. But, as an adult, I wouldn't buy Star Trek cereal. I'd still stick to Raisin Bran, Cheerios, or Mini-Wheats. But, a beer-drinking Star Trek fan? "Mom! Did you remember to pick up some Klingon Beer? And some Cheetos?" Okay, maybe that's unfair. Some of us that grew up on the original series actually moved out of the basement years ago. And, who knows. You might actually be able to pick up a green woman with it. So, there must be more Star Trek fans in Canada for their marketing plan to work. If that's true, what does that say about Canadians, eh? @ Jimmy - "...what does that say about Canadians, eh?" That they'll drink anything that resembles beer. ...you're r i g h t !" "Here's Mudd in your eye!" "The Beer With The Extra Fizzbane"
"How About a Game of Tri-Quarters?" "The Best Thing to Come Down the Pike In Years"
I love the fact that I know that little picture is from Star Trek 4, and that the beer he's drinking is Michelob. No Cheetos! You will need Pork Rinds to complement this. I suspect this will compete well with Pig's Eye. 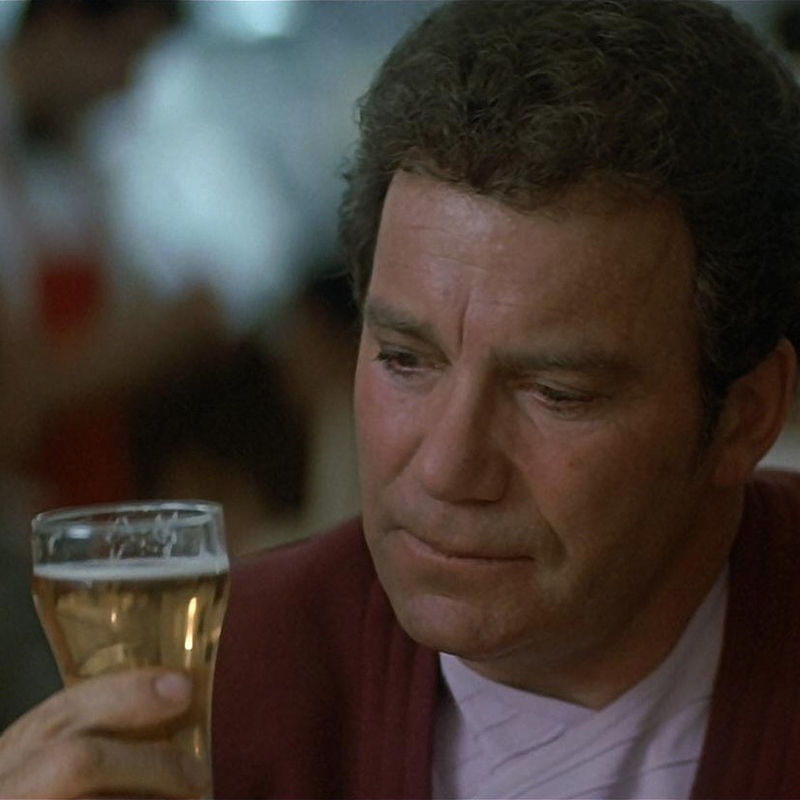 "Though I’m a Star Trek fan — Kirk > Picard — I’m not a beer drinker." I'm a non-beer-drinking Star Trek fan as well...but ya got your *greater than* sign pointing the wrong way, Basil. Is that Lt. Worf on the label or Michele Obama? Really don't care about the Star Trek aspect, but it does sound kind of tasty.